Very few of you must be familiar with the company called Ubiquiti and their products. They are a fairly new on the market but growing with every minute. It is absolutely not surprising because their products are absolutely amazing. Ubiquiti equipments are aimed to offer an enterprise level management platform with a simplified user interface. It is an absolute pleasure to work with any device they have released. But what does put them higher than the rest of the market is the reliability and the price they come at. Ubiquiti Networks is an American technology company started in 2005. Based in San Jose, California Ubiquiti manufactures wireless data communication products for enterprise and wireless broadband providers with a primary focus on under-served and emerging markets. Such brands include airMAX & airFiber for Outdoor Wireless, UniFi series of managed wired & wireless networking products, as well as sunMAX Grid-tied, complete solar kits. We had the opportunity to work with Ubiquiti’s enterprise level wireless solution and their software defined network called UniFi. A few words about the design of the products, they are smart and modest. You can hardly even notice an installed access point, they feel so natural for the eye, if it would have been always there. They are equipped with the latest wireless technology to provide a strong and reliable network connection. The access point can be powered though the Ethernet cable from a POE (Power Over Ethernet) capable switch or router. It is very important to highlight that these devices are only Wireless Access Points and not Routers. UniFi® is the revolutionary Wi-Fi system that combines enterprise performance, unlimited scalability, and a central management controller. UniFi 802.11AC Dual‑Radio Access Points (APs) have a refined industrial design and can be easily installed using the included mounting hardware. Easily accessible through any standard web browser, the UniFi Controller software is a powerful software engine ideal for high-density client deployments requiring low latency and high uptime performance. Use the UniFi Controller software to quickly configure and administer an enterprise Wi-Fi network – no special training required. RF map and performance features, real-time status, automatic UAP device detection, and advanced security options are all seamlessly integrated. 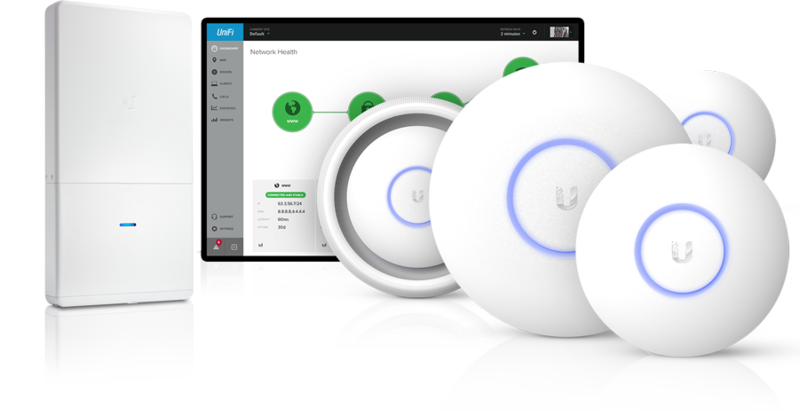 We are very satisfied with the services that Ubiquiti offers with Unifi and we do recommend to all our customer. All devices work seamlessly with each other. If you are looking for an affordable enterprise level wireless network that is manageable from anywhere and you are interested in such a solution please feel free to contact us for advice or a quotation.